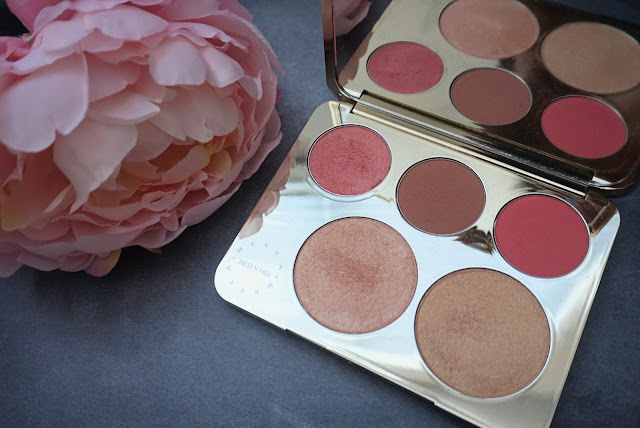 Becca Cosmetics has been on a roll lately with lots of new product launches, from their lavender iridescent highlighter and bronzers to now a new face palette in collaboration with Chrissy Teigen. 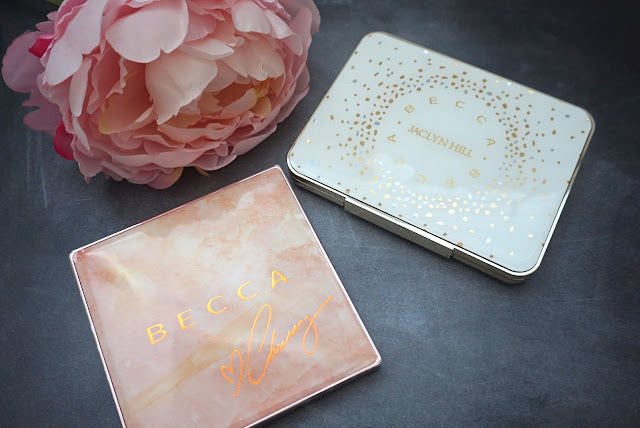 To be honest, I was very surprised at this collaboration, it was quite unexpected, but based on the fact that it was being launched by Becca, plus the package was just too beautiful to pass up. 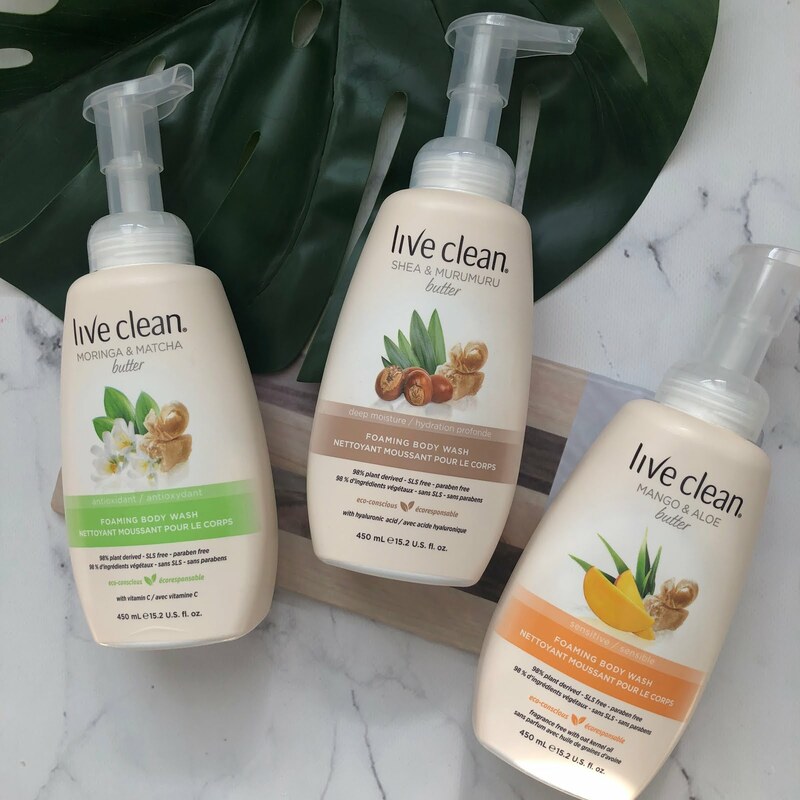 The rose gold packaging and marble theme is gorgeous, but how did the product hold up? 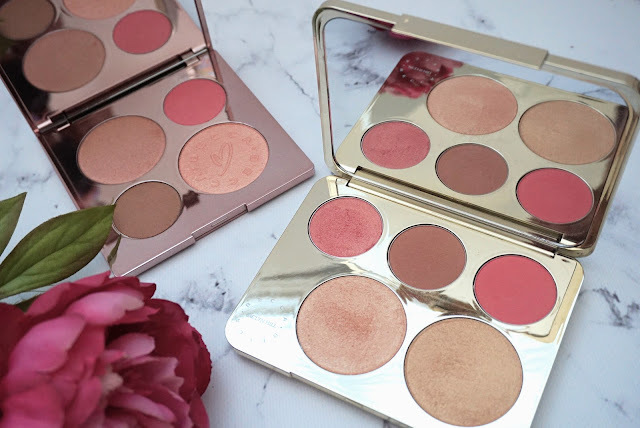 Keep on reading below to read all about my thoughts as I will be comparing it with the Becca x Jaclyn Hill collaboration (link to my past review on that post) as well since most of you will be curious about how they compare to each other in terms of color pay-off and delivery. 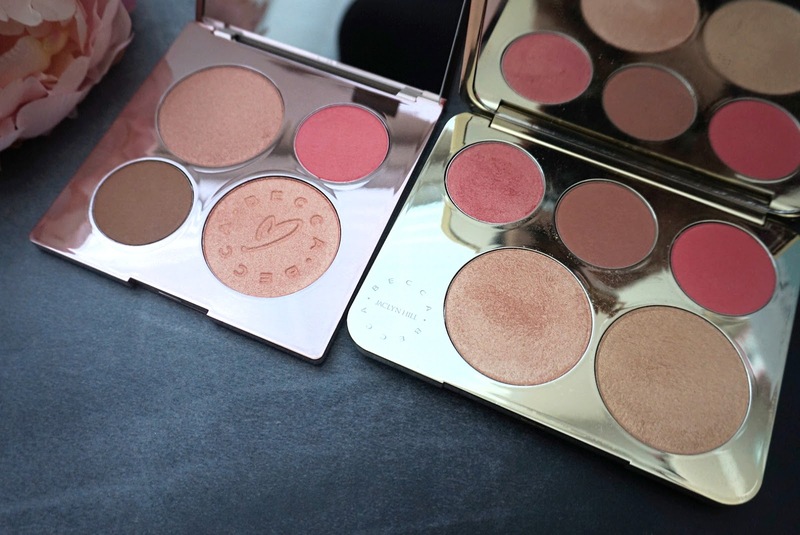 In the pictures directly above and below, you will see on the left, the Becca x Chrissy Teigen Palette and on the right, the Becca x Jaclyn Hill Palette. The Chrissy Teigen Palette features two highlighters, one blush and one bronzer. 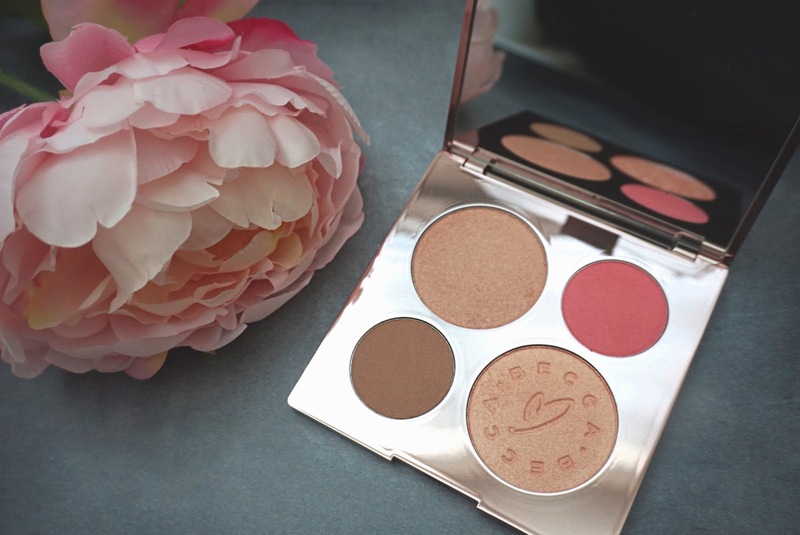 It is a true bronzer - not too warm, not too cold. The Jaclyn palette bronzer/blush is a bit more warm toned so most people would use that as a blush. 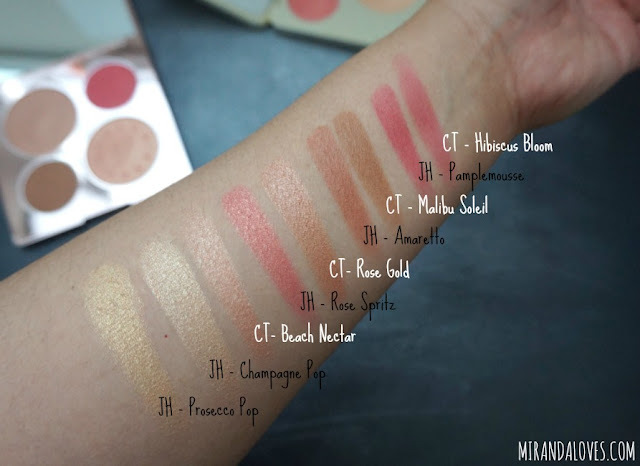 Chrissy's palette's highlighters all run on the pinker/rose gold tones. 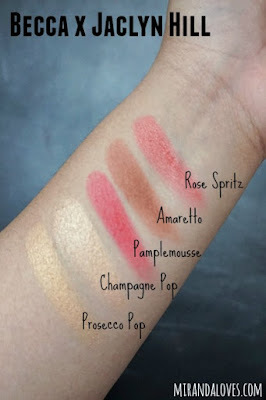 The blush is also more matte satin. The Jaclyn Hill Palette contains two blushes, one bronzer/blush, and two highlighters. This is thicker than Chrissy's palette and of course bigger. 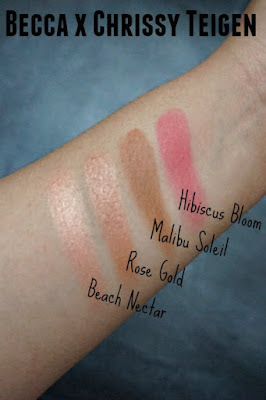 One blush is a a satin and one is a shimmer tone. The highlighters run more champagne and gold than Chrissy's. As you can see, while the satin blushes are quite similar - Jaclyn's Pamplemousse and Chrissy's Hibiscus Bloom, Jaclyn's bronzer/blush runs a tad more warm/red toned than Chrissy's true bronzer. The highlighters are also significantly different as well. I did a side by side comparison below of the two palettes. Chrissy's in white font and Jaclyn's in black font. To wrap it up, would I suggest that you buy Chrissy's palette? 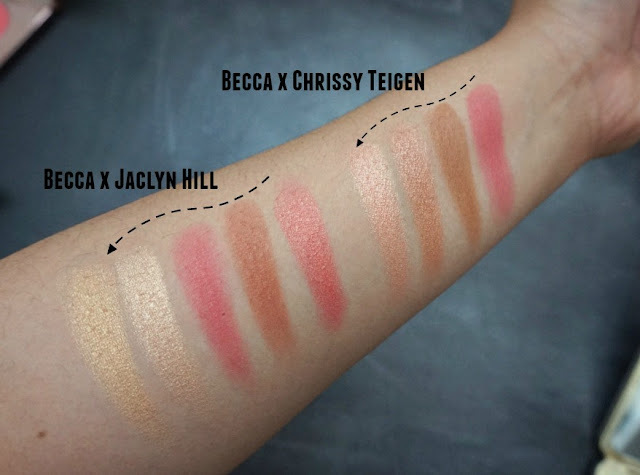 To be honest, even if you're not a big Chrissy Teigen fan but you're a highlighter or Becca fan, I'd say get it. There is no current highlighter offered by Becca that runs close to that offered in Chrissy's collab palette. 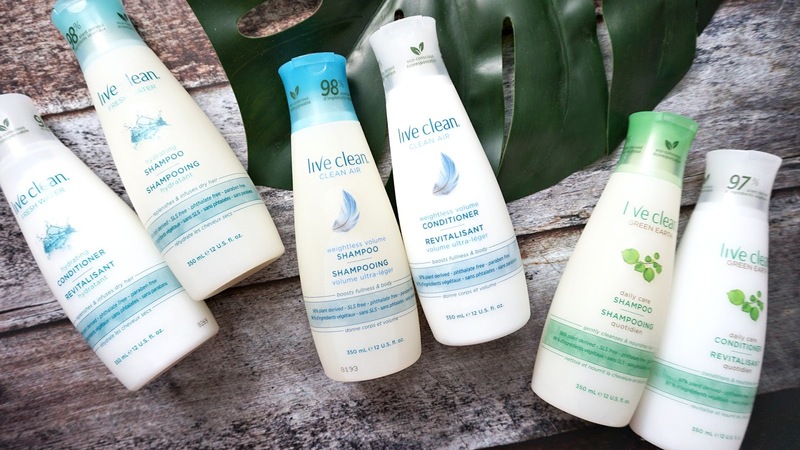 This packaging is too pretty and if you're a make-up lover then you need it!